Born in San Diego, California on August 30, 1918, the Boston Red Sox' Ted Williams was one of Baseball's greatest hitters and the last player to bat over .400. Combining keen vision and a scientific approach to hitting, he set many batting records despite missing nearly five full seasons due to military service as a pilot in WWII and Korea. His accomplishments include a .406 season in 1941 ( a record which still stands), two Triple Crowns, two MVPs, six American League batting championships, 521 home runs, a lifetime average of .344 and 18 All-Star games. On his last trip to the plate on September 28, 1960, Ted thrilled the fans at Fenway Park by hitting home run # 521 off Baltimore's Jack Fisher... a fitting finale to a spectacular career. He was elected to baseball's Hall of Fame in 1966. 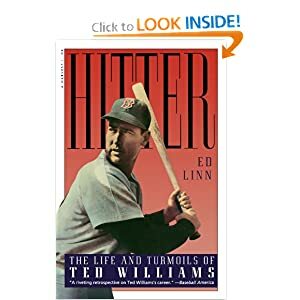 After a long decline in health, Ted Williams died on July 7, 2002 at the age of 83.